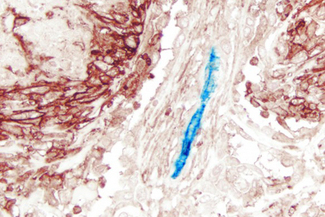 This substrate produces a blue chromogen/blue fluorescent precipitant in the presence of Alkaline Phosphatase (AP) enzyme. Suitable for brightfield and darkfield visualization in IHC, ICC, and ISH, as well as various blotting applications. 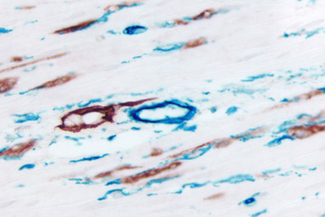 Sufficient to produce 200 ml of working solution. 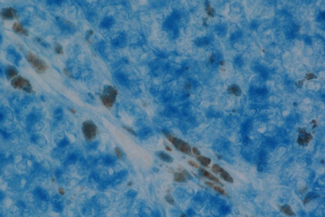 Features: - Blue chromogen /blue fluorescent precipitant - Fluorescent (Excitation: broad, peak at ~500 nm / Emission: broad, peak at ~680 nm) - Precipitated by Alkaline Phosphatase (AP) - Suitable for non-aqueous (permanent) mounting - Sufficient reagents to produce 200 ml of working solution - For Brightfield, Darkfield, Electron, Spectral Imaging - Suitable for IHC, ICC, IF, ISH, Blotting Applications, and Elispot - No wait times for mixing and dissolving powders or tablets - Suitable for use in single or multiple labeling assays - Heat Stable - Contrast with Tissue Pigments - One year expiry date Applications: - Immunohistochemistry - Immunocytochemistry - Immunofluorescence - In situ hybridization - Blotting Applications - Elispot Details: The Vector Blue™ AP Substrate Kit produces a blue, heat stable reaction product. 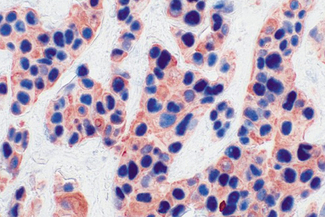 This chromogen can be used singly or in combination with other alkaline phosphatase or peroxidase substrates for multiple label applications. 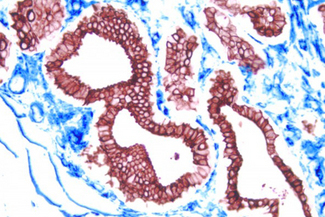 With the aid of imaging systems and software, the spectral profile of this substrate can be distinguished from other enzyme substrates in applications where antigens are co-localized. 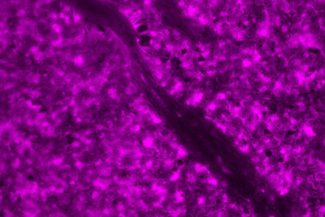 Vector Blue™ is also fluorescent. 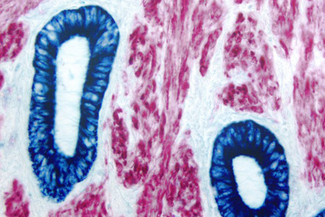 Sections stained with the Vector Blue™ substrate can be dehydrated, cleared, and permanently mounted; however, non-xylene clearing agents and non-xylene based mounting media (such as VectaMount) must be used because the reaction product is soluble in xylene. 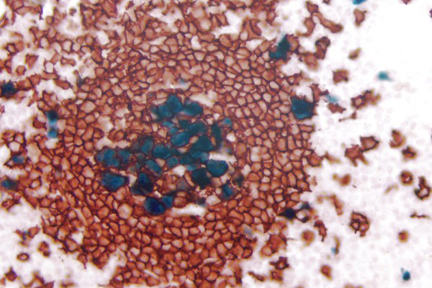 Vector Blue™ can also be used on blots in applications such as ELISPOT, singly or in combination with a peroxidase substrate such as AEC. 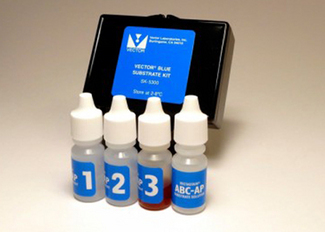 This kit contains stock solutions in convenient dropper bottles. 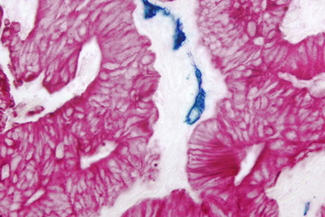 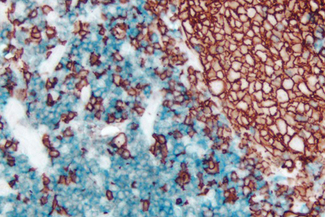 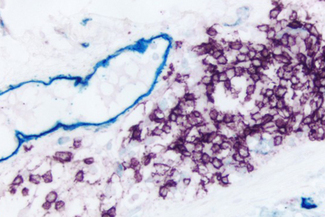 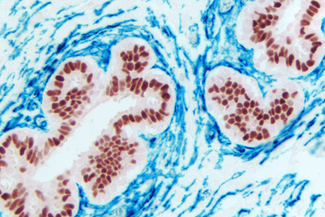 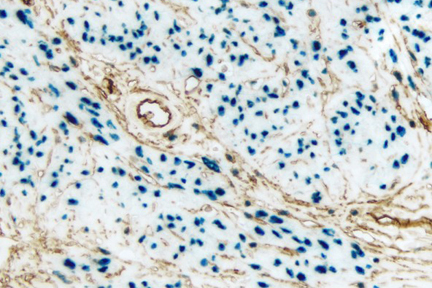 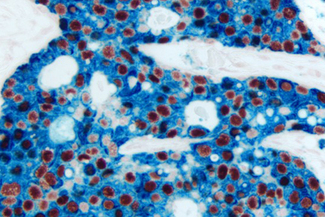 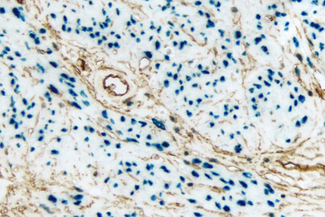 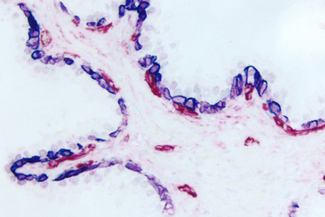 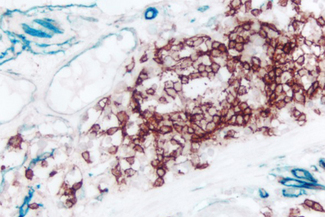 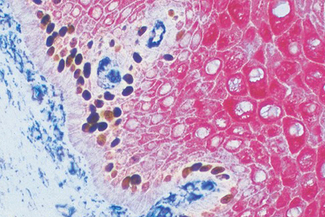 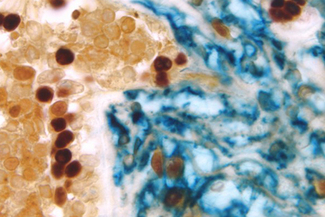 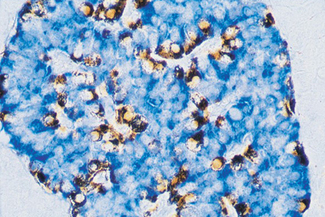 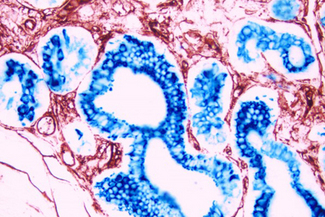 Melanoma: Anti-Vimentin (rabbit mab), ImmPRESS-AP Anti-Rabbit IgG, Vector Blue™ Substrate (blue).